Rhinoplasty can address moderate and severe breathing issues, all while replenishing facial harmony for male and female patients. It is quite common to experience functional issues that make it difficult to breathe naturally. One of the most common issues that our clients ask about is the deviated septum. Other than breathing problems, Los Angeles and Beverly Hills clients may be experiencing symptoms such as difficulty sleeping, excessive snoring and constant feeling of having a stuffy nose. Our patients can correct deviated nasal structures with septoplasty combined with rhinoplasty from an experienced facial plastic surgeon. The septum is a structure of cartilage that divides the middle of the nose, and quite commonly, patients realize that the middle of the nose is obstructing one or both nasal airways making it difficult to breathe easily out of both nostrils. Septoplasty is a procedure designed to remove excess cartilage and shift the septum back into its normal position in the center of the nose. Then cartilage grafts are put in place to enhance straightening and create a strong nasal foundation. 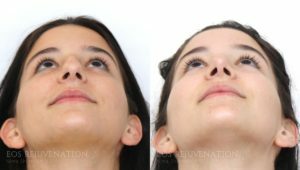 This procedure focuses on relieving structural breathing issues only, but many patients develop bumps on the nasal bridge after a broken nose, which can require aesthetic correction with rhinoplasty. This procedure can be performed alongside septoplasty to treat the breathing structures and improve the appearance of the nose. Patients who confirm their desire to correct aesthetic appearances along with functional breathing issues can achieve their goals in one procedure. Under the expertise of an experienced board certified plastic surgeon you have the advantage of acquiring only one surgery and a single recovery period. According to the American Society of Plastic Surgeons, patients with breathing impairments should seek rhinoplasty correction to adjust nasal structures and alignment. Patients can look forward to a more symmetrical shape without causing disruption to other facial features. More importantly, patients will no longer suffer from breathing obstructions, snoring or nosebleeds. The goal of our rhinoplasty procedure is to reshape and restore facial harmony by creating a natural-looking nose that is suitable for you. The results can be seen for yourself in our patient photo above and at the side. This patient had trouble breathing, a severely deviated septum and weak nasal cartilages. After rhinoplasty with supporting cartilage grafting, his nose now looks aesthetically pleasing and he is able to breathe without any former nasal blockage. To find out more information about correcting a deviated septum and other aesthetic nasal issues, please call our office in Beverly Hills to schedule a consultation at (310) 772-2866. Your path to clear breathing is waiting, call us today.